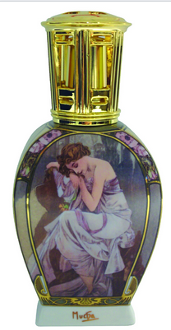 The Czech artist Alphonse Mucha's Art Nouveau painting "Day and Night" is rendered on this beautiful Lampe Berger lamp. The rich but muted colors of Mucha's painting are highlighted by 24 carat gold enamel on this graceful lamp. The lamp comes in a nice gift box with all the accessories. Lampe Berger recently discovered a cache of these lamps sold only in Europe some years ago. Lampe Berger collectors will find this lamp to be priced right!